Welcome to this special New Year's Eve edition of our Weekly Market Wrap Podcast, I'm Mike Gleason. In this final edition for 2015, we'll review the year that was and look ahead to what may be in store for 2016 in the precious metals. We'll also hear an encore of one of our best interviews this past year. 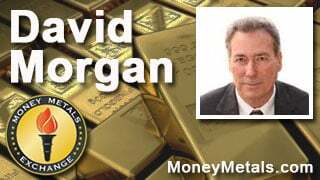 Our friend David Morgan of The Morgan Report joined us in studio over the summer for a spirited and enlightening conversation on a range of topics including the future of the mining industry, inflation versus deflation and what got America's silver guru into the silver market at such a young age. Don't miss my interview with David Morgan coming up in just a moment. Well, overall, 2015 was a tough year for investors. Everyone knew going in that they wouldn't get much of any return on cash equivalents. In Europe, drastic measures by the European Central Bank brought yields on some short-term debt instruments to less than nothing. Negative rates – the latest danger for holders of cash on deposit at banks. The hunt for yield drove investors into the corporate bond market. But higher yields mean higher risk, and many investors got burned in so-called high-yield bonds. In the fourth quarter, junk bonds suffered their worst rout since the financial crisis of 2008. Trouble in the corporate debt market could be a harbinger of bad things to come for the economy and stock market in 2016. By conventional valuation measures, U.S. stocks appear overvalued heading into the New Year. So far, stocks are holding up – but barely. The Dow Jones and S&P 500 will both finish the year essentially where they began it. The major averages broke some significant technical levels in August, yet stocks defied predictions of a fall crash. The Dow surged in October and held on to most of those gains as the year closed. One of the other big trends of 2015 was the rising U.S. dollar versus foreign currencies. The strong dollar put downward pressure on most foreign stock markets, along with commodity prices. Crude oil prices plunged to as low as $35 dollar a barrel – an extraordinary move that could bring disinflationary pressures in the early months of 2016. Against the backdrop of a strong dollar and falling commodity prices, precious metals prices didn't have much of a chance to post gains. Every rally and breakout in 2015 turned out to be short lived. For the year, gold shows a loss of 10.2% with just a few trading hours left before we close the books. The gold market will finish 2015 near the bottom of its trading range, with prices currently coming in at $1,062 an ounce. Similar story for silver. The white metal is down 11% for the year to trade at $13.89 an ounce as of this New Year's Eve morning recording. The carnage has been far worse in the platinum and palladium markets. Platinum prices are now 26.5% cheaper than where they started off the year. Platinum now checks in at $887 an ounce. Its sister metal palladium currently trades at $549, and takes home the unfortunate distinction of being the worst performing precious metal in 2015 with a 31.1% year-over-year decline. The takedown in spot prices has pushed the mining industry to the brink. It sets up what could be a very big trend in 2016: supply destruction. We'll certainly have more to say on supply shortfalls in the weeks ahead. On the demand side, bullion sales went gangbusters in 2015 as bargain hunters snatched up gold and silver coins, bars, and rounds in record quantities. That's the biggest nugget of fundamental good news coming out of the precious metals markets in "The Year That Was." If physical demand remains robust in the months ahead, there could be some fireworks in the futures markets. Leverage in the futures market for gold has reached epic proportions. Since August, the ratio of paper contracts to underlying physical inventories has moved from 124 to 1 all the way to 325 to 1. From this extreme, it wouldn't take much to trigger a run on the bank. All it would take is a tiny percentage of futures contract holders demanding physical delivery. Regardless of whether a default or disruption in the futures market takes place, the ongoing divergence between paper and physical markets will get resolved somehow. The potential for it to resolve in sharply higher spot prices in 2016 certainly exists. The potential for the Federal Reserve to throw investors curve balls also exists. But all the talk in the financial media throughout 2015 about rate hikes turned out to be much ado about nearly nothing. Yes, the Fed finally did inch up rates in December. But markets were little affected. Here's hoping that financial reporters make it their New Year's resolution to spend less time speculating on the Fed's rate decisions and more time covering the real economy. As we noted in our podcast following the Fed's rate hike announcement, precious metals actually tend to perform well during rate-raising campaigns. Markets can gyrate in any direction for any reason on any given day, week, month, or year. But looking even further out beyond 2016, what will drive precious metals prices are the forces of supply and demand in the physical market. No amount of paper price suppression can create new physical supply or thwart physical demand from industrial users and investors. Mike Gleason: I'm happy to welcome back our friend, David Morgan, of The Morgan Report and author of the fabulous new book The Silver Manifesto. We don't get the opportunity to do face to face interviews all that often but David is here in person in our Idaho headquarters facilities and we're doing this from our little recording studio. First off, David, welcome and thanks for joining us as always and thanks for paying us a visit. David Morgan: Mike, great to be with you and thank you for the tour. It's quite a facility, brand new or I guess less than a year old. I've been through more than one of these. I have to say you've thought through everything on the security bases as well as any I've ever seen. Mike Gleason: Well, thank you very much for the feedback there. We certainly appreciate that. It's great having you here. Before we get into the book which I definitely want to cover with you today – which is a fantastic read by the way – I wanted to have a little bit of your background as a primer because obviously your experiences had a lot to do with creation of this book. How did David Morgan come to be so fascinated with silverware and how did it all start for you? David Morgan: Well, on my first book, Get the Skinny on Silver Investing, I wrote that when I was 11 years old that the coin has changed from 90% silver coins to what we call the Johnson slugs. That caught my attention but certainly at that point in my life I had no idea what I'd be doing at this point in my life. It's something I sort of didn't really forget about but didn't pay much attention to. After all, I was 11 years old. But I was fascinated by money and markets even as a small youngster. When I was 16, I asked my dad if I could I start trading stocks and I actually was allowed to do so. There's a form I don't even know if it exists anymore, it's called the Uniform Gift to Minors Act, if the parent signed it, then you're allowed to trade stocks under the age of 18. I started doing that. I, on my own, started looking into monetary history and what money was and all that stuff. I discovered very early on about the goldsmiths and how they loaned out... or how they put out certificates that didn't have one-to-one correspondence to the amount of gold that they held because they discovered that maybe one out of 10 people came into actually claim the certificate for gold. The whole fractional reserve banking and how it was done. I became very fascinated about banking and fractional reserve banking and how the system really worked and I knew most of the stuff by the time I was 17 years old. When I had some money on my first job, real job, I mean, I worked summer jobs. But when I got my first real job and started saving money in a serious way, I started looking to precious metals and primarily gold because it seem from what I've read to that point in time that gold was the best place to be. As I saw the first market in gold from the early 70's to the January 21st 1980, I was pretty much gold focused. Then after the fall of that time frame and silver pulled back substantially and so did gold, I asked the big question, why do the Hunt brothers buy silver? Why didn't they buy gold? What were they so interested in about silver? Then knowing later, not at that time that Bunker Hunt felt the correct ratio between silver and gold was 5 to 1. During the peak of the silver market, it actually hit the 16 to 1 monetary ratio very briefly, that one day when silver peaked. I started looking at silver. The more I read, the more I studied, the more I developed a study of silver, the more it became apparent to me that although more volatile, it held far more potential than gold. When I came into the business I'm in now and got in the internet and stopped just consulting and decided to start writing a newsletter, it definitely was silver focused for a lot of reasons but primarily just because the background that I had through experience in the gold market and subsequent when I'd learned and studied about the silver market post 1980, not that I didn't have any silver exposure on the first run up, I did, but I was again was primarily focused on the gold market until after the fact. Mike Gleason: In the months leading up to the release of The Silver Manifesto, I recall you saying that this is the book you've been wanting to write for several years, perhaps even since you wrote your bestselling Get the Skinny on Silver Investing so it truly was years in the making. It's incredibly comprehensive. You and coauthor Chris Marchese go through all aspects of silver from its history as a monetary metal, the industrial component and the drivers there and now the huge amount of investment demand that is developed over the recent years, it truly is the bible on all things silver. So I imagine that even you, the silver guru as many people refer to you as probably learned something about the metal that you didn't know. Talk about the book and give the audience who hasn't yet had a chance to read it, an idea of what it's all about. David Morgan: Well certainly I did. I learned a little bit more about the potential for silver in the electronics realm, this LED lightning, this light-emitting diode. Chris did a lot of research on that. So there were several areas in that aspect of the book. One of the things I learned was how difficult it is to write about the bullion banking, fractional reserve banking and basic economics in a manner that hopefully as lively but more difficult is to write it in a manner that people want to read it and understand it because without an understanding of basic economics, and most people as soon as you say the word, it's like taking a couple of sleeping pills. They're ready just to nod off. I get that. But it's critical to understand it to really have a solid basis or foundation to understand why precious metals are so critical especially during this time that we're currently living. That is the biggest challenge. I think we rewrote those chapters like four, five times, tweaking them here, tweaking them there, trying to make them better, trying to make them more understanding, not over explain anything and not under-explaining anything. The nine months, I think, probably those three chapters were the ones that we just continually pounded again and again and again. Of course, you look at the Amazon feedback, most of it is very positive. There's a few people that it's hard to read or whatever and I get that. It's not a book for a super intellect by any stretch of the imagination. We try to make it readable for everybody but there's some people that would read it that would probably find it difficult. It is more of a textbook type of a book than perhaps a novel of some type but it's not a novel. It's about the silver market, it's about money, it's about monetary history, it's about the economy. It's about why we're where we are and what we can do about. It's about choosing a mining company, how to analyze a mining company. It's about how to set up a profile and a portfolio where you manage risks to reward, why top tier mining companies are more important in some ways than junior mining companies, why junior mining companies offer more exposure to risk than others. On and on it goes. Basically, with Chris' help, it's what I've accumulated in 40 years of experience that I put in a book. There's a lot of heart and soul in it and certainly I wanted to leave, and I don't like to use the word legacy, I'm just another human being, one of 7 billion on the planet, but I certainly devoted my life to understanding money, metals and mining and this book gave me the opportunity to present, I'd say, the cream of that into a format that hopefully will have fairly decent shelf life. Mike Gleason: Prices on the physical seem to be at artificially low prices, well below the all in cost of production which you often write about. Around the last time you were on CEO of a primary silver miner called First Majestic, a very well-known one, had just urged other mining companies to follow his lead and hold back some of their production from the market, choosing instead to sell it later when prices were not depressed or suppressed, I guess we could say. Has the idea of putting a squeeze on all those leverage short sellers gotten any traction from other companies or it is mainly just First Majestic at this point? David Morgan: Well at this point, I would say it's probably just First Majestic. But if you go back into history, Gold Corp had this situation, and of course it's a gold company but they were holding back production and banking it in a vault. A shareholder in the early days, Gold Corp owned gold bullion and shares in the company itself. I was urging other silver mining companies to adopt a similar manner of doing business to actually. Two actually adopted it in a rather minor way. One is Silver Standard. They did that for a little while and Endeavor Silver also did it for a short time frame. But Keith (Neumeyer – CEO of First Majestic) is really the one in present day that's done it, not only recently with what you outlined but also Ted Butler came out recently and urged people to write a letter, urged mining companies to write a letter to the CFTC and explain that these markets, the way that they are traded, are well outside of the realm of what the intent of the law is. Keith did a great job. First Majestic, this is NYSC company, symbol AG, I own a stock by the way, I should get that in there. But it's a step forward. Whether others would follow or not, I do not know. But I admire Keith. He's always been, let's say, outside of the box of most of the CEOs I've met in the space. That goes from top tier which his company definitely is to even the mid-tiers and the juniors, a lot of them just don't really want to get involved. I get that. It's easier to do nothing than to do something and there's various reasons. I'm not going to tell anybody what they should do or shouldn't do, but I really admire the fact that he stepped to the plate and did it. It's a lead move. We'll have to wait and see if it has any bearing as far as what the response will be from the authorities but I certainly love to see if he gets a response and what it is. Mike Gleason: You certainly have to commend him for sticking his neck out in some way. I'd definitely like to see him recruit others in the mining space to do the same just so we can hopefully get away from some of the shenanigans that take place in these futures markets that are really hurting some real companies out there. You see it first hand, obviously we've got ... mining companies have had a very difficult time or some of them anyway. Do you expect to see any more consolidation in that industry? What are you seeing there and what's the mood like? David Morgan:Well, the mood is pretty down. I mean, a lot of these miners have been suffering. Some have gone out of business. Some are moving together into one office space, two or three companies in Vancouver for the smaller companies. Thompson Creek is basically on care and maintenance although they don't talk about it in those terms. I think they laid off like one third or two thirds, I forget which, of the workforce. You're seeing a lot of consolidation, cutbacks, slimming in products. Then a lot of companies have high graded in order to stay in business. That's typical in these downturns that companies, if they can, not all of them can, will go into the mine and they know where the grades vary and they'll get the highest grade because it's the richest ore and therefore your loss is less or maybe you're still managing to eek out a small profit. But that weakens the overall ability of the company when things come back because your overall grade strength has been lessened because you high-graded. There's a lot of things in the industry that have been rather bleak for quite some time. I think we will see further weakness but not much longer. Again, I'm trying to be as objective as I can meaning that I think the bottom is in, I think the worst is probably behind us. I don't think we have much further to go. So I think anyone's that held on this long probably make it over the hump and will start seeing better times for the miners. Having said that, I could be wrong. It's possible that with what's going on in the greater picture, I'm sure you asked me during the interview, the bond markets and the Greek exit situation and all that is happening that we could see some weakness in the main commodities and also strength in the precious metals. For example, you might see a weakness in some of the base metals, maybe moly(bdenum), maybe copper that's shown a little bit of strength here, fall back off. Then some of the other softs in the commodities come off but food going up and moving up this problem with this bird flu again. There's been a lot of depopulation, the chicken supply and the egg supply, that will cause prices to rise in eggs and chicken. So you're going to see these things where, I don't think I coined the term, but I certainly emphasized it that the dynamic change is primarily going from things that you need, what cause more and things that are debt based, will cost less or at least be able to be obtained. You can look at the housing market. It's still bubble-ish in some sectors. Car loans are easy to get. Both of those are debt based purchases but food is not a debt based purchase in most cases. It's buy and eat it. Food prices certainly are not going down. That's a need. Again, I'll say it one more time, things that we need are probably going to cost more overall than things that we don't necessarily need but we continue to purchase, especially our leverage will continue probably to at least vary and oscillate. The banks will give these loans or whatever. They're getting lighter or easier to make purchases using credit that it has been for some time. Mike Gleason: Touching on the bonds, I do want to ask you about that. Obviously all markets are tied together in some way or another and perhaps one of the linchpins is the bond markets and a lot of trading activities is dictated off of what happens there. Now, you had some interesting things to say about that when we were talking earlier at lunch. What is the bond market telling you right now? What are you seeing there? David Morgan:Well, interest rates are reciprocal of the bonds' price. As interest rates go higher, bond prices go down. We have seen the bond market selloff meaning that the interest rates are forced higher. In fact, the German bond is at 0.9% now. It hasn't sold off as hard as it has recently until October of 1998 when the hedge fund long term capital management imploded. Early on in my speaking career, I talked about The Trillion Dollar Bet which is a movie all about the long term capital management fiasco. So that's a big indicator. The other one of course is Mario Draghi (head of the European Central Bank) talking about spooking the markets because he talked about preparing for higher volatility. That's due to the Greek situation. The inflation in Europe, is that part of it? Yeah, it could be. But certainly this debt crisis with Greece, is really boiling over. I mean, everyone knows that they're missing this payment with the IMF and that's something that hasn't happened ever as far as I know. All these things, Mike, are coming to the fore. The debt markets are the problem. They continue to grow and yet at this point in time, they are probably the most unsafe place you could be for your money. I want to digress for a moment because I've been through so far this bull market, that I think will continue to be a bull market eventually. But I went through the full cycle in the 1970's to 1980. And the best move you've possibly could have made and I didn't do it, but at hindsight's 20/20, is that you sold your gold in January of 1980 and you bought the long bond. I think it was like 20% or so at the time and you held that for 30 years. You could not have done anything smarter than that. But you know what, no tree goes off the sky, kicking the can down the road, eventually you'll run out of road and this is the time where you got to rethink that fabulous move that some people made that's wearing out. Bonds were supposed to be the safest investment you can make. But all these sovereign debts, which means nation states cannot pay back their bond debt. Because of that fact, you have to really rethink if bond investment is safe or not safe. Most of the bond market revolves around big money. It's bank to bank, nation state to nation state. I mean, Germany doesn't want to Greek default because they've loaned them all this money. That's a nation state. What happens in the next round in my very studied view will be it won't be corporate debt that fails, it won't be real estate debt that fails, although both of those could be repercussions, it will be governments that fail. And how does a government fail? A government fails when its sovereign debt cannot be paid. This is what is taking place with Greece as we speak. What are the ramifications? Can a nation state with, what 12 million people, I think that's correct, fail? But that systemic risk that triggers what happens in Germany, which triggers what happens in the rest of the Euro market, does that trigger what happens in London and does that trigger what happens in New York? You bet it does. They're all interconnected. Because they're all interconnected, a small failure like 12 million people that can't pay back the debt that they owe could have repercussions far greater than just that one country. So that's what we're facing. That means that we're in a situation that's far more precarious than we were in 2008. Mike Gleason: One of the other things we were talking about offline was just the fact that we do have kind of two camps right now, the inflation camp and the deflation camp. I know you travel on all these conferences and you run into a lot of smart people who have a lot of really informed decisions and opinions on what's going to happen there. Where do you fall on that? What do you think the way out of this is? Are we going to have a deflating default or are we going to have an inflationary event here that takes place? Where do you come in on that? David Morgan: Well, there's really two main ways to have a depression. There is a debt liquidating depression, which is what we saw on the 1930's. And there is a hyper inflationary depression. Before I give you my final answer, I'll discuss the likeliness of both of them. In both those cases, you have high unemployment. You have high uncertainty about the economy. You have a high mistrust of government or government officials or authority in general. You have the general malaise of the populous. You start to see areas of need or want that are not fulfilled very easily. For example, you'll find shortages in certain supply lines, supply chains. So those things all happen it's a hyper inflationary depression or a debt liquidating depression. The main difference is that in a debt liquidating depression, there's a huge contraction in money the supply and that money is more valuable than ever. In a hyper inflationary depression, the situation is that the government that holds the debt is able to try to print its way out of it. Meaning that the money becomes worth less, worth less and then more or less worthless, where the trust of the people is actually null and void. People don't trust the currency anymore. It fails. The side I lean toward is that that's the way we're going to go, but I rule out hyperinflation. You do not need a hyperinflation of a currency crisis. That's not a requirement. I do not believe in a hyperinflation because of the bond market. As interest rates are forced higher, the bond prices go down which deflationary. However, it's a trust issue. People will move to what they trust the most which the first thing that they trust the most is physical greenbacks or the checking account or the money market account. So they'll move out of all of their asset classes that will be stocks, that will be bonds, that will be master limited partnerships, it will be anything that you could sell to somebody through a broker that you could sell and turn to cash. That will be the first run. The run will be the cash. This comes to the extra pyramid which you can look up on the internet, I've discussed it many times. That will be perceived safety. However, that isn't the safest place you'll go. So as more there are more debt defaults or more happen, there's a likelihood that there'll be a certain amount of that cash that runs to gold. Gold and silver are at the tip of the extra pyramid meaning, it's liquidity of all time and there's no counter party risk whatsoever. You could liquidate a million dollar portfolio and stick it in the bank and feel very safe and then have what happened in Argentina happen to you. Meaning that you've got the million dollars in the bank and the bank won't touch it. They're not even going to do a bail in. No bail in. Well David, I thought you said there could be bail ins? It could but in this case there isn't. However, the bank sends you a little notice that says you're only allowed to withdraw $200 a week from your account. Your million dollars is safe and sound with us no problem, however the currency control mechanism set by the federal government now says that you're allowed $200 a week. How would that sit with you? Not very well. At least I know it wouldn't with me. This is exactly what took place. The idea's exactly right. The amount isn't correct but the idea is exactly what happened in Argentina. These are things people should think through. You want to be outside of that before it happens. Will it happen? I don't know. Could it happen? Absolutely. Could a bail in and a restriction on currency flows happen? Yes, both could happen. So the only way outside of that system is the money of all time. Coming back on point, and this is what I want to emphasize, we have never had a debt liquidating depression where the currency superseded and went on when it was not a gold backed system. Let me restate that more succinctly. Every time you had a non-backed currency and a depression, it has been of the inflationary variety. There is not one instance in history where it's gone the other way. So to say that it will go the other way, you're saying that 4,000 or 5,000 years of recorded history that for once that paper money will trump gold. I don't think that will be the case. It could be. I don't rule it out. I don't want to be consistent. As I've said, I've never ruled out completely that a debt liquidating depression could take place and that currency itself actually goes up in value and does better than gold. I really don't believe that. I think you could have something of both happening at the same time and I'll restate I just stated but didn't probably emphasize enough, you could see a run in the cash and cash looks better than gold for a while but then the ultimate money and the smartest money moves into gold or at least hedges some of that cash into gold and gold market is so small that as that cash went from cash into the precious metals, you would see the metals come up and the dollar go down relative to each other. That's what I really expect, a run to the dollar and then a run of the gold. That's kind of what we've been witnessing anyway. Again, the bond market can't hold forever. Interest rates will be forced up by the market. The Fed had a lot of control but not ultimate control, the market does. And eventually we're already seeing the crack start to take place in the bond markets, in the Euro and the Spanish bond market, the German bond market, the US bond market and the trust level starting to lessen. It's just like going into a worthless paper currency. It doesn't happen overnight. The 1913 dollar is now worth about 4 cents. That took over 100 years but at some point it becomes worthless. That's where we're heading toward. Does that mean absolute zero? No. We'll get a resent before we hit absolute zero. Mike Gleason: Well it's certainly a crazy world financially. I'm glad that we have studied in smart people like yourself to help explain it all. We appreciate you coming on. It's great insights as always. It was great to see you and thanks for paying us a visit in person this time. David Morgan: Mike, my pleasure. Thank you. Mike Gleason: Well, that will do it for this week. Thanks again to David Morgan. Again, the book is The Silver Manifesto. I strongly urge everyone to pick up a copy of it. If you've ever bought silver or thought about investing into bullion, mining stocks, ETFs, anything, whatsoever, this authoritative book on silver is truly second to none when it comes to the silver market. It's available at MoneyMetals.com for $27.95 as well as Amazon. Pick up your own copy today, you definitely won't be disappointed. Well we hope you enjoyed the encore performance of that interview, as well as the conversations we had with our all of our other wonderful guests in 2015. We look forward to continuing to bring you the best and most noteworthy interviews in the precious metals community in the 2016 and want to extend our special thanks to the tens of thousands of you who listen or read our podcast transcripts each and every week. After special Thursday releases these last two holiday weeks we'll resume our regular Friday schedule next week. Until then this has been Mike Gleason with Money Metals Exchange, thanks for listening and here's wishing everyone a safe, prosperous and happy New Year. And I'll talk to you again in 2016.